MS asks: The image size limit for GIFs is way too low. Our work shines with hi-res photography, and I honestly can’t get a GIF small enough to work! We agree, MS! Your work really does shine in high res. We increased the size limit for animated GIFs to 3MB, so send away! And for more great insight on incorporating GIFs in your email, be sure to check out Andy Perdue’s post here. 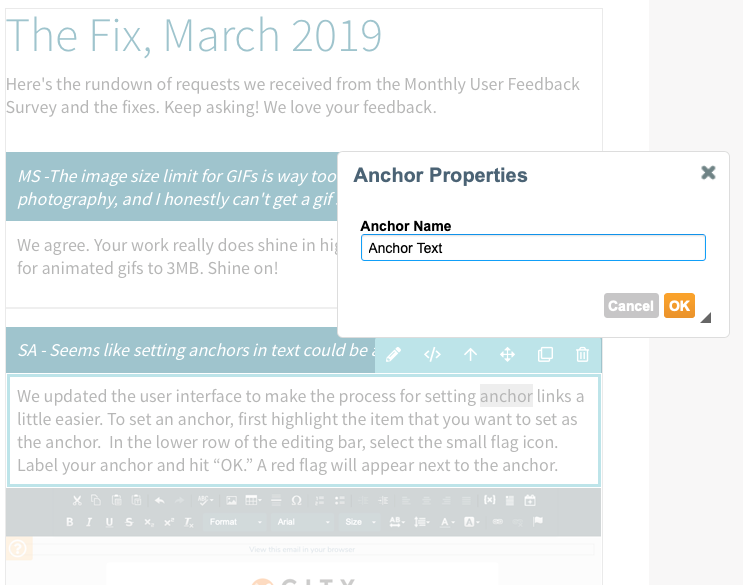 Says SA: Seems like setting anchors in text could be a little more…intuitive. Next, click on the linking text and select the “link” icon in the lower row of the editing bar. 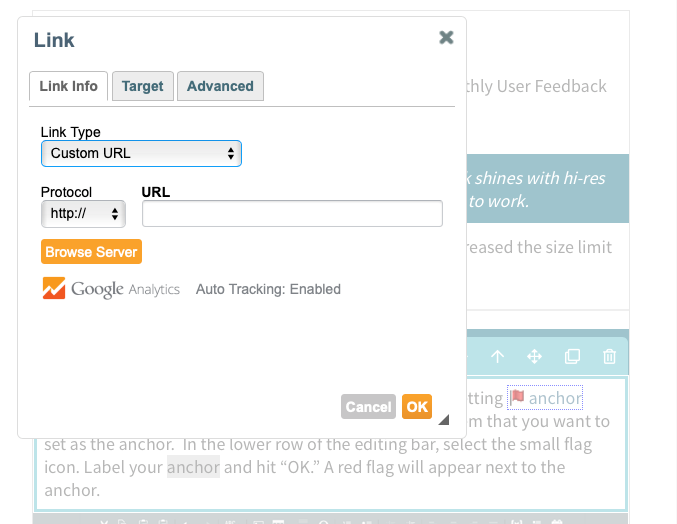 In the dropdown menu, select the type of anchor you want to set. Hit “OK” and you’re all set. CZ wants to know: any updates about the LinkedIn changes? LinkedIn recently implemented security changes to the LinkedIn Marketing Developer Program. We are modifying our API to be compliant with the latest updates. More information to come as needed. And Lastly, the And Then Some Conference Is Coming! Save the date for the And Then Some Conference on August 23rd! We’ll have more updates to come in the next few weeks, so be sure you’re receiving our conference information by signing up here.